Modernista, the Boston agency I wrote about after they won the Cadillac account (which had been at Leo Burnett since 1936), has done it again. Their planner Gareth Key announced the redesign of the agency web site, but it is far from what you'd expect. They use Wikipedia as the agency home page, Flickr for photos, YouTube for videos and so on. In other words, they walk the talk. Wikipedia is a site for people, by people. It's not controlled by Modernista! It is controlled by subject matter experts and people who are passionate about the independent subjects within Wikipedia's pages. 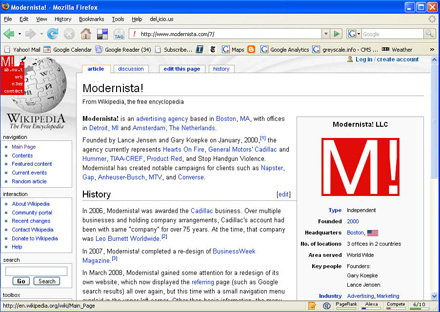 In setting the Wikipedia page as their main page, Modernista! says, "People define what brands are, so we want people to have a say in defining who we are - you tell us who we are." Normally, when you link directly to the site you get the nav module on top of the site you're on, like this. That is fab, although the nav was a bit difficult to view with my setup which probably impacted my experience of it. It also took me a few secs to figure out what was going on, but I overcame it. I remember at my last agency, asking why we had to post photos of a party on our site (and use bandwidth and storage) when we could just provide links to flikr, so also use the web how people use it as individuals. Wierd. Even the digital department looked at me like I was an alien. Unsurprisingly, I'm not working there anymore. Frustratingly, many people just don't get it. Anther year, another agency. I recently suggested using GoogleEarth as a recruitment tool for a major financial services company's global talent programme. What better way for candidates to explore the company's international sites and get excited about different locations and world travel (for free)? The client's comment? Too complicated. Bring me enlightened clients, accounts people who can enlighten or even clients who are open to being enlightened.